"He's actually a really cool guy." Screen Media Films has unveiled the first official trailer for an enjoyable indie comedy titled Literally, Right Before Aaron, telling the story of a heartbroken man invited to the wedding of his most recent ex-girlfriend. Justin Long stars in this fairly typical story about a guy dealing with a tough breakup and accepting the reality of letting go, while embracing the comedy in romance. The ensemble cast includes Cobie Smulders as his ex, as well as Ryan Hansen, John Cho, Kristen Schaal, Dana Delany, Peter Gallagher, Lea Thompson, and Luis Guzmán. This premiered at the Tribeca and Nantucket Film Festivals and seems like a painfully funny, awkwardly charming little comedy. Take a look. Still reeling from his recent breakup, Adam (Justin Long) is devastated when he learns that his ex (Cobie Smulders) is engaged. What’s worse is he's invited to the wedding. When Adam returns home for the festivities, he must confront his unresolved feelings and an uncertain future in hopes of convincing himself and everyone else that he is truly happy for her. There he discovers the comedy in romance, the tragedy of letting go and the hard truth about growing up. 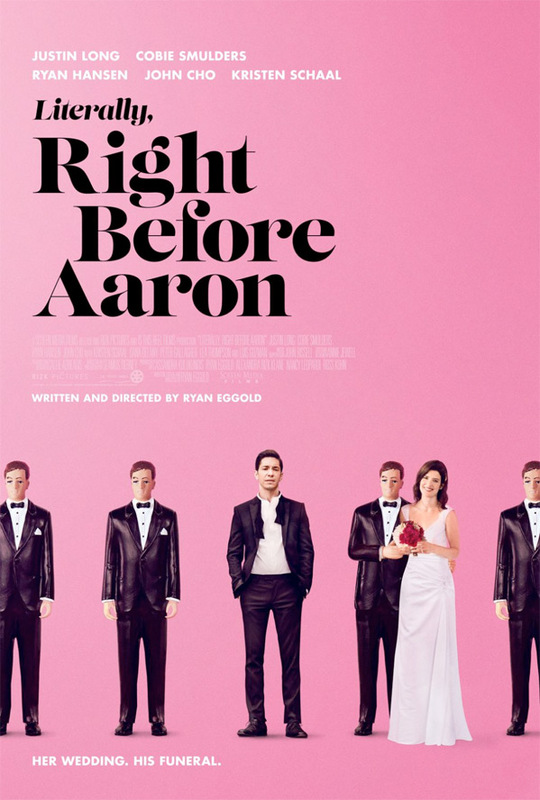 Literally, Right Before Aaron is both written and directed by American actor-filmmaker Ryan Eggold, a USC graduate making his feature directorial debut adapting his own short film. This first premiered at the Tribeca Film Festival earlier this year. Screen Media Films will open Literally, Right Before Aaron in select theaters + on VOD starting September 29th next month.